Cristiano Ronaldo celebrate his return with a goal for Juventus as they grab a comfortable 2-0 win in the Serie A clash over Udinese. 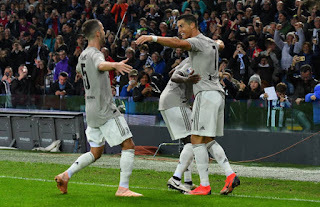 Ronaldo served his Champions League suspension in midweek but came back to double his sides tally after Paulo Dybala's opener. The portugal international star had an earlier opportunity to score, missing a glaring opportunity when he headed over the crossbar. Dybala made his count though, leaping high to head home after 34 minutes following a great cross before Ronaldo's goal moments later. 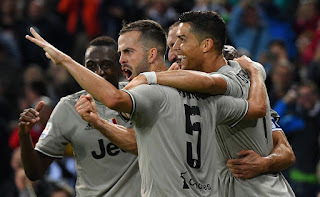 Ronaldo received a pass before striking the ball low into the bottom corner to double Juventus advantage. He came close to scoring again later on, but Simone Scuffet was equal to his strike before Juventus saw out the win.